The base for all this cuteness are mini heart-shaped pizza crusts, which I made using this giant heart cookie cutter. Feel free to cut the pizza crust into other cute shapes though, such as a flower, butterfly, star – any large cookie cutter will do. 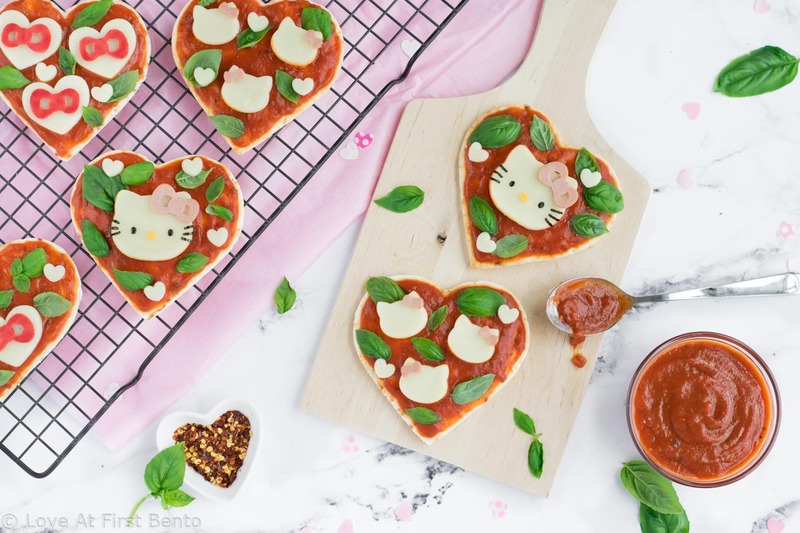 Spread some pizza sauce on top, a few leaves of fresh basil, and your mini pizzas are now ready to be Hello Kitty-fied! 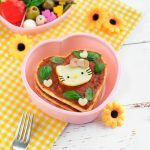 Since we all know that decorating a pizza is where the real fun begins, I put together three Hello Kitty pizza design ideas to help get your creative juices flowing. I used thick cut mozzarella cheese for all my Hello Kitty and heart cutouts, but feel free to use any hard white cheese you’d like. This design is sure to be any Hello Kitty lover’s dream come true! I cut out Hello Kitty’s head from mozzarella using my Hello Kitty onigiri mold, which I found was the perfect size for my mini pizza crust. 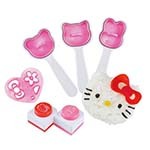 The Hello Kitty food cutter that comes with the onigiri mold was used to cut out her nose and bow, which were made from orange cheese and bologna, respectively. If you want her bow to be red, try using red pepper or pepperoni; I wanted my bow to really stand out against the red pizza sauce, so I opted for the pinkest deli meat I could find. And finally, Hello Kitty’s face is completed with nori eyes and whiskers, which are easily made using a Hello Kitty nori punch. If you’d rather stick to more of a “pizza” theme, try using black olives instead. 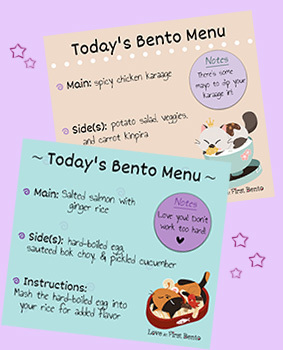 This design is not only super cute, but also super easy to prepare. 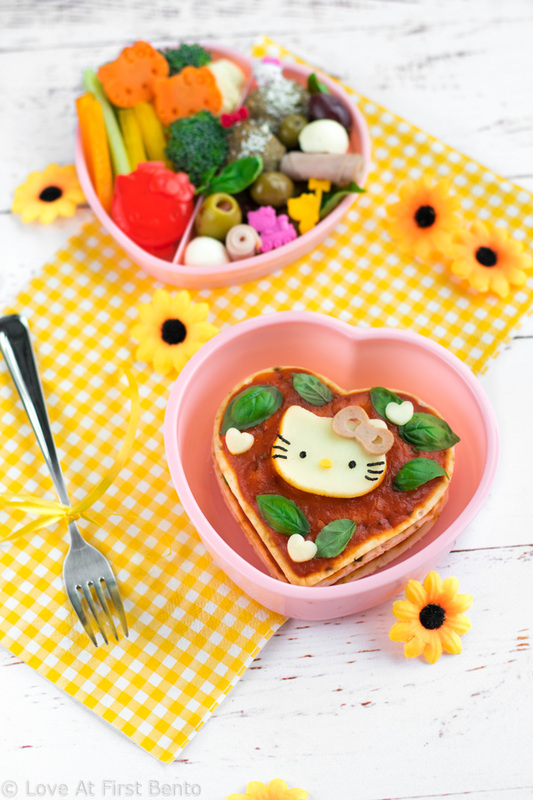 Using mozzarella and bologna, 2 – 3 Hello Kitty heads can be created and used to top a single mini pizza. You can, of course, add some tiny nori facial features to each cutout, but I rather liked the simplistic look of just the Hello Kitty head and bow. Again, feel free to swap out the bologna for red pepper, pepperoni, or any other pink deli meat. Who doesn’t love Hello Kitty’s adorable red bow? I cut out bows from bologna, colored them red using an edible food marker, then placed them on top of a mozzarella cheese heart, so that they’d really pop against the white. There are many alternative ingredient options for the bow; try using colored white cheese, red pepper, pepperoni, or any pink deli meat instead. 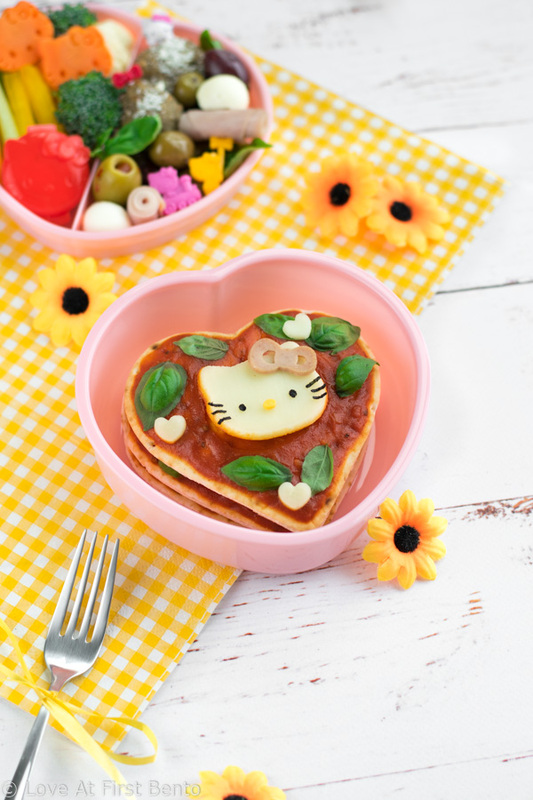 Once your Hello Kitty pizza toppers are ready, you can choose to either assemble them on your pizzas before packing them into a bento, or – and this is a super fun option – you can pack all the components separately into your bento, so that they can be assembled at lunch time however the eater chooses! 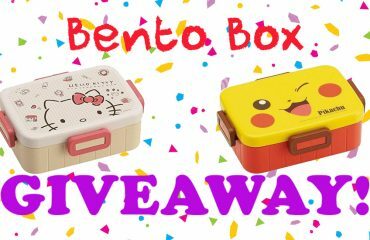 It’s basically like a bento lunchable, except 50 million times better because, well, it’s Hello Kitty. 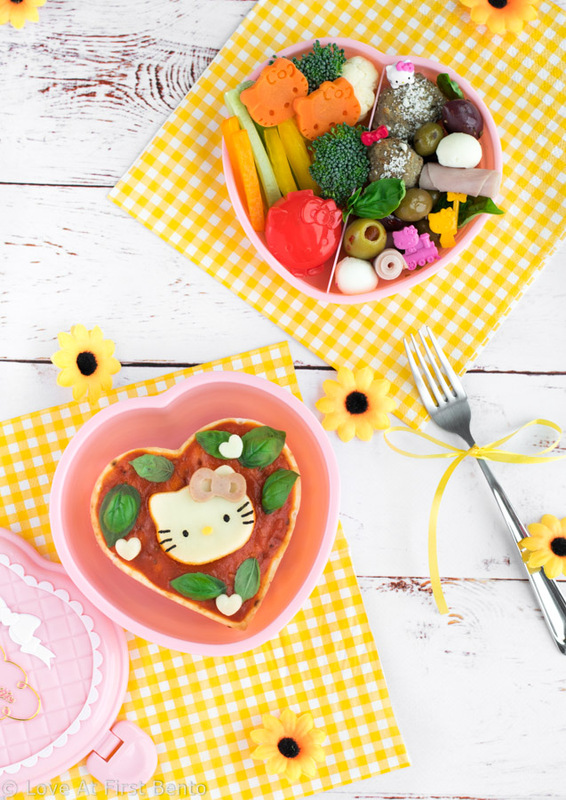 What kid (or adult) wouldn’t love getting a DIY Hello Kitty pizza bento for lunch?? Fair warning: everyone will be insanely jealous. 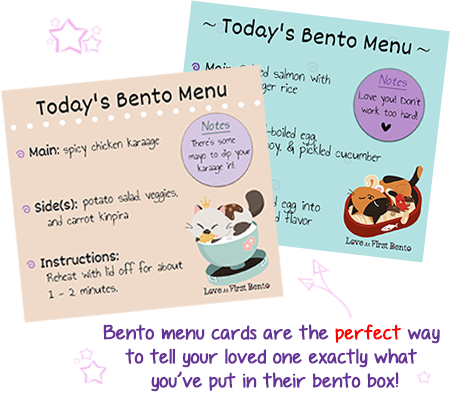 Guard your bento with your life. 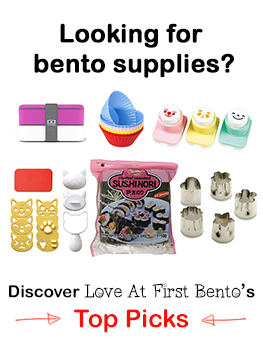 I stacked my Hello Kitty pizzas into one compartment of a heart-shaped bento box, then filled the other compartment with a variety of antipasto goodies that I thought would pair well with pizza. The sides included veggies with dip, parmesan meatballs, assorted olives, and mini bocconcini and prosciutto “bites”, which I skewered onto these adorable Hello Kitty food picks. And, since I truly believe that you can never have too much Hello Kitty in life, I added various Hello Kitty bento picks to the meatballs, used my Hello Kitty veggie cutter to create Hello Kitty carrots, and packed the vegetable dip in a red Hello Kitty sauce cup. There can never be too much Hello Kitty, after all. 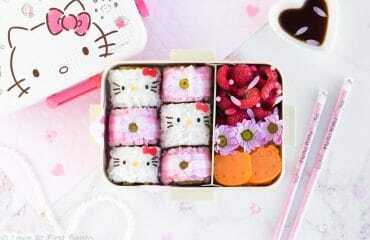 So why not turn your next bento into a Hello Kitty pizza party? 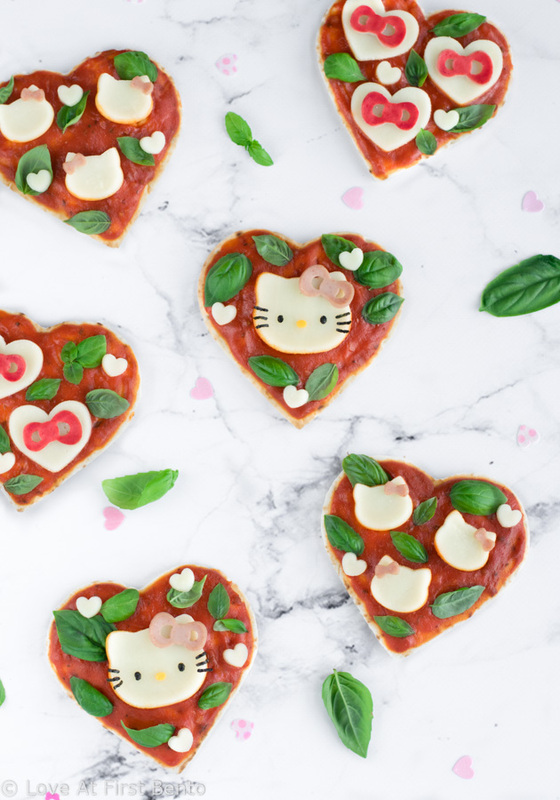 No one can resist these charming heart-shaped pizzas, which are sure to be a guaranteed hit with kid and adult Hello Kitty fans alike! Plus, with so many fun customization options, there’s a Hello Kitty pizza that’s bound to be your perfect match. I mean, let’s face it – who could seriously pass up a freakin’ Hello Kitty pizza? Yea, um, no one. Using the large heart-shaped cookie cutter, cut out a heart shape from the pizza crust. Repeat until you have the desired number of mini pizza crusts. Spread pizza sauce atop each heart crust, then top with fresh basil leaves. Using the outline of the Hello Kitty onigiri mold (the pink insert portion) as a cutter, cut out a Hello Kitty head from a slice of mozzarella cheese. Use a toothpick to help you remove the cutout from the mold (be careful not to tear the cheese). 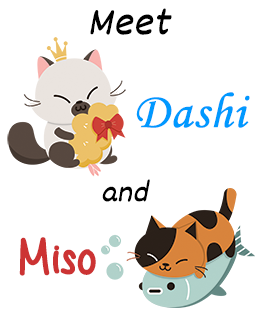 Using the Hello Kitty nori punch, punch out the full design from the nori. Reserve the eyes and whiskers, and discard the nose. Using the bow portion of the Hello Kitty food cutter, cut out a bow from the bologna. Using the nose portion of the Hello Kitty food cutter, cut out Hello Kitty’s nose from the slice of orange cheese. Using tweezers, apply the mozzarella Hello Kitty head onto the middle of a prepared pizza crust. Add the nori eyes, nori whiskers, cheese nose, and bologna bow (I recommend using a Hello Kitty picture as a guide when doing this). Optional: Decorate the rest of the pizza with mini mozzarella cheese hearts, made using the mini heart-shaped food cutter. Using the small cat-head cutter, cut out 2 – 3 cat heads from the mozzarella cheese. I used 2 – 3 cat heads per mini pizza, so cut out as many as you’ll be needing. 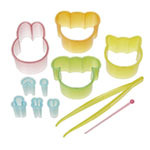 Using the tiny bow cutter, cut out 2 – 3 bows from the bologna (or enough bows for each mozzarella cat head you have). Using tweezers, place the mozzarella cat heads onto the prepared pizza crust, in whatever pattern you’d like. Finish by adding a bologna bow onto the ear of each cat head – it should resemble a mini Hello Kitty head, without the facial features. 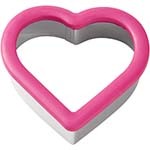 Using the small heart-shaped food cutter, cut out 2 – 3 hearts from the mozzarella cheese slice. I used 2 – 3 cheese hearts per mini pizza, so cut out as many as you’ll be needing. 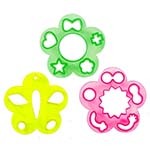 Using the bow portion of the Hello Kitty food cutter, cut out 2 – 3 bows from the bologna (or enough bows for each mozzarella heart you have). Color one side of each bologna bow red using the red edible food marker. Using tweezers, place the mozzarella cheese hearts onto the prepared pizza crust, in whatever pattern you’d like. Place a colored bologna bow on top of each mozzarella heart. Possible bologna substitutions: red pepper, pepperoni, or any pink deli meat (such as ham or prosciutto). To make these pizzas completely vegetarian, replace the bologna with either red pepper, white cheese colored with a food marker, or pink dyed egg crepe (recipe can be found here). Hi Shannon, I’ve just shown this to my daughter and she LOVES it. She has demanded that I make it for her next packed lunch. 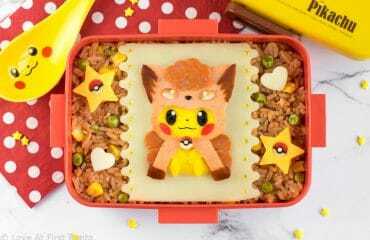 🤔 Not sure my bento skills are up to the job but I’ll give it a go. Thanks for the great recipe. 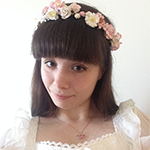 Thank you so so much! 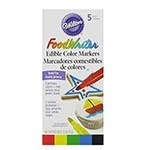 <3 Omg you're right, these would be amazing at a Hello Kitty themed birthday party, mini or full-sized - love that idea! Aww, thank you so much Kelly! If you have the right tools, these pizzas are actually super easy to prepare – you should totally give it a try! Even just making mini heart-shaped pizzas with little cheese hearts on top would be adorable, and I’m sure your nieces would love it! these are so cute!! the hello kitty faces look awesome, though i think the silhoutte heads are probably more my speed (; glad you’re doing better (and tbh, health > blogging any day).